Planning a trip to Shanghai Disneyland? Fastpass planning is an essential part of making sure you get to enjoy all the major attractions of Shanghai Disneyland. In this post, we answer some basic questions about Shanghai Disneyland Fastpass and give some tips. We put these tips to work in our Shanghai Disneyland One-Day Itinerary. What is Shanghai Disneyland Fastpass? Shanghai Disneyland Fastpass is a program that allows you to avoid lines at select attractions by getting a ticket (physical or electronic) that assigns you a one-hour window to come back and skip the line (or at least most of it). Which Shanghai Disneyland Attractions Use Fastpass? 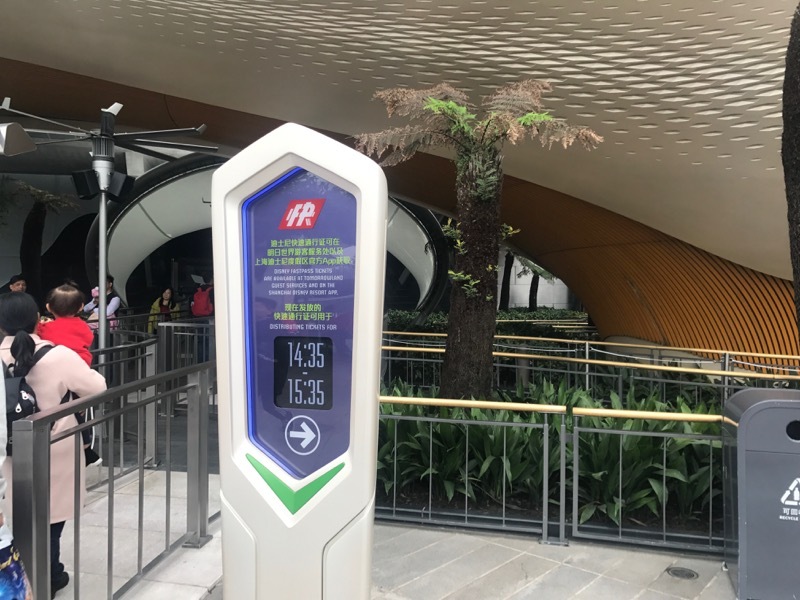 There are SEVEN attractions with Shanghai Disneyland Fastpass — TRON Lightcycle Power Run, Buzz Lightyear Planet Rescue, Seven Dwarfs Mine Train, The Many Adventures of Winnie the Pooh, Peter Pan’s Flight, Roaring Rapids, Soaring Over the Horizon. We discuss which attractions you should use Fastpass on below. How Can I Get A Fastpass? Shanghai Disneyland offers two ways to get Fastpass. The easier/faster was is to use the Shanghai Disneyland app. Right on the home page of the app is an option to "Get Fastpass". To use this option, you'll need to scan or manually enter the ticket information for your party, but once you've done that you can grab Fastpass tickets for your entire group on the app. After clicking "Get Fastpass", you'll be brought to a list of available Fastpass time slots. Note that unlike at Walt Disney World, you can't choose your time slot. The one-hour Fastpass window rolls forward in 5-minute increments as people obtain Fastpass slots until all slots in the day are taken. The Fastpass will be linked to your park ticket, which you'll scan at the attraction. The app gave us scannable QR codes for each of our Fastpass tickets, but the cast members always instructed us to scan tickets. The second way to get a Fastpass is to go to the attraction itself and use a physical kiosk. We didn't actually do this ourselves, but our understanding is that you would scan your ticket and get a receipt indicating your time slow. However, the Shanghai Disneyland Fastpass is actually linked to your ticket (as when you get one on the app) and the receipt cannot be used as proof at the attraction. I can comment on the "advance fastpass booking" situation. We checked in to the Toy Story Hotel yesterday and when we purchased our tickets, we were told we could select one fastpass per day for our group as hotel guests. We had to choose the attractions and times right then and there. I checked a couple of hours later and the fastpasses showed up on the app. It was a nice and unexpected perk! If you have this perk, you're probably going to want to use the advance bookings for Soaring or Snow White Mine Train. The reason isn't that these are the best rides, but they're really the only ones with much difficulty obtaining Fastpasses. Okay, this has to be said: don't buy Shanghai Disneyland Fastpass tickets from strangers. No, seriously. You'll definitely see guys outside the park selling something that looks like "VIP Access." Ignore them! You may hear people inside the park trying to sell Fastpasses. Ignore them! This guy is trying to sell some combination of park tickets and Fastpasses. Don't buy them! This is just something that happens at Shanghai Disneyland. We've covered this and similar issues in our post on the culture of Shanghai Disney Resort. Can you have more than one Fastpass at Shanghai Disneyland? Yes! As always, contrary to what you may otherwise hear, you can hold multiple Fastpass tickets at once, provided that you wait the required amount of time to get a second one. Usually, you can get a new Fastpass at the earlier of: two hours into the future and the start of your next Fastpass window. Occasionally, though, we had weird things happen, like being able to get our next Fastpass only 7 minutes after the start of our Fastpass window. What major Shanghai Disneyland attractions don't have Fastpass? Challenge Trails at Camp Discovery is the most significant attraction that does not have Fastpass. Pirates of the Caribbean Battle for the Sunken Treasure, Jet Packs, and Explorer Canoes are good attractions without Fastpass, the latter two usually having a longer wait than Pirates. 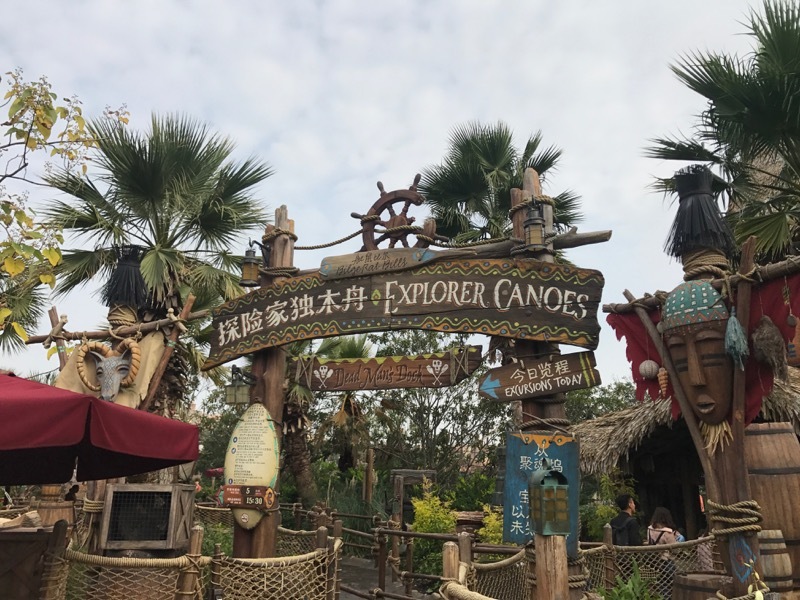 The only way to get on Explorer Canoes is to wait in line, but we think it's worth it! What Rides Should I Plan to Use Fastpass On? If you're new to Soaring and Snow White, those are good uses for Fastpass. If, however, you've ridden them at another resort (Walt Disney World has both), Rapids is a better choice. TRON Fastpasses will go, but we found the waits to be reasonable most of the day. Winnie the Pooh and Peter Pan tend to roll throughout the day with some availability until late afternoon. While we were there for two days, Buzz Fastpasses were never more than 5 to 15 minutes into the future, and it was a walk-on at most times. Buzz Lightyear Fastpass distribution, taken at 14:34. What if I don't get a Fastpass I need? Grab a different one or, if it's still early, go wait in line! Soaring is the biggest challenge to squeeze into Shanghai Disneyland. Fastpass goes quickly, and lines get long. Beyond that, you should be able to get everything in, maybe having to ride Snow White single rider if you can't grab a Fastpass for that either. As we discuss in our one-day itinerary, after an efficient, busy morning, the afternoon can really be for whatever you want at Shanghai Disneyland. What is Shanghai Disney Premier Access? Shanghai Disneyland offers "Disney Premier Access," which allows you to purchase a single-use ticket to skip the line at the Fastpass attractions plus Pirates of the Caribbean, which is not currently a Fastpass ride. You can buy these for the individual attractions or buy all 8 as a set. You can purchase Shanghai Disney Premier Access right from the home page of the app. As of this writing, the Shanghai Disney Premier Access set is 275 CNY (about $42) and each individual attraction is 50 CNY (about $8). We can't imagine needing more than five of these, so the set will rarely be worth it. If you haven't ridden Soaring, we would probably say this is worth the 50 CNY, with the caveat that the ride did not appear to be at 100% when we rode it in November 2017 (lines on the screen were visible). By using Shanghai Disney Premier Access for this ride, you won't have to deal with the annoyance of a long line or a big gap in your Fastpass planning. Do you have any questions or tips about Fastpass at Shanghai Disneyland?